Associations predicting boom after case of mad cow disease found in U.S.
HAGERSTOWN, MD. ? Organic beef producers predict the U.S. mad cow scare will boost demand for their meat, which comes from animals fed only milk, grasses and grains from birth to slaughter. Mad cow disease, officially known as bovine spongiform encephalopathy or BSE, is believed to be spread through cattle feed containing protein or bone meal from infected cows or sheep. Although the government banned feeding cattle such products in 1997, organic food advocates say the law has loopholes and is poorly enforced. U.S. organic beef standards, which took effect in October 2002, provide for certification of producers whose practices have passed muster with either a state or private inspector. The standards include an all-vegetable diet once the animal is weaned. “We will now see a huge increase in the demand” for organic beef, which currently accounts for no more than 1 percent of U.S. beef sales, predicted Ronnie Cummins, national director of the Organic Consumers Assn., of Little Marais, Minn.
Nick Maravell, owner of Nick’s Organic Farm, said he sold all the beef from his small, but growing, Black Angus herd in Adamstown, Md., almost immediately after the autumn slaughter. Maravell, vice chairman of the Maryland Organic Food and Farming Assn., said he expected next year’s crop of six animals to go just as fast. Chicago-based Dakota Beef Co. claims to be the nation’s largest organic producer, with 25 farms and processors under contract to produce beef that will start showing up in national supermarket meat cases in 2004. Some say the organic advocates are using the mad cow news to create panic over the food supply. 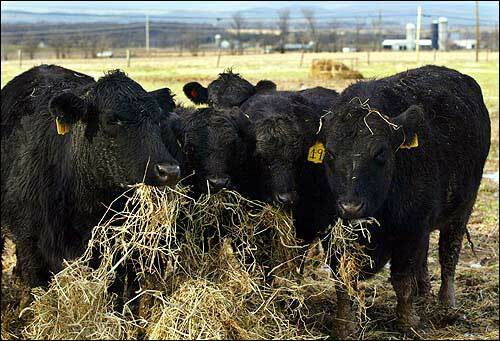 Certified organic beef cattle eat hay on Nick's Organic Farm in Adamstown, Md. They were pictured Wednesday, a day after a case of mad cow disease was found in Washington. Certified organic cattle cannot be fed animal byproducts, which are the suspected cause of mad cow disease.